We get a lot of people asking about custom jersey framing. Some just want their jersey mounted on its own in a simple frame. Other people want to turn their jersey into a statement of accomplishment. 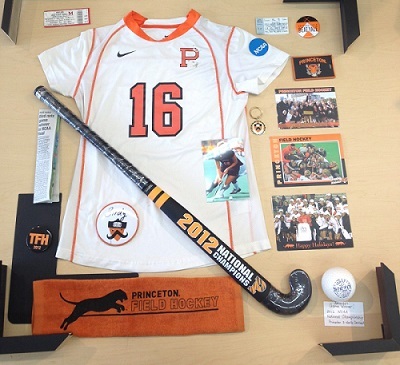 After four years of playing on a university field hockey team, you can imagine the amount of sentimental memorabilia you would accumulate. Ticket stubs, photos, baseball caps, key chains, game towels, the team coffee mug…even the game winning ball were just some of the pieces a family recently brought to us for framing. When framing jerseys, it is often a nice touch to add some of these other little details in the frame to create a bit of visual interest. It is a great idea to bring in as many items as you can so your framer can help narrow down what will look best in a frame. Keith and the customers eventually narrowed down the items to include in the frame. Throughout the process, it is important to continue re-arranging the items. Trying out different layouts is the best way to determine what the most attractive arrangement will be. Make sure you are happy with the composition, and your framer can fiddle with the finer details of the exact placements. We always take a photo of the rough layout as a reference for when we start mounting everything into the frame. Custom jersey framing can be tricky, but the tricky aspect of this one frame was the field hockey ball. Its diameter is too big to be able to fit inside any of the moulding we are able to order from our suppliers. Short of sawing off half of the ball, the only option left was to get creative! We decided the best approach would be to cut a hole in the backing and have part of the ball sticking out the back of the frame. The ball is then held in place with a combination of friction and silicone.